Although those in a coma do not respond to stimuli in a meaningful way, contrary to popular belief they do not always lie quiet and still - in some cases they can move, open their eyes and even talk. 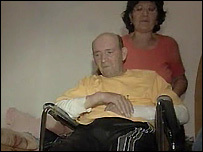 "It was Gertruda that saved me, and I'll never forget it," Mr Grzebski told news channel TVN24 of his recovery. "I cried a lot, and I prayed a lot," Mrs Grzebski said on Polsat television. "Those who came to see us kept asking: 'When is he going to die?' But he's not dead." The following year's elections ushered in eastern Europe's first post-communist government. "What amazes me today is all these people who walk around with their mobile phones and never stop moaning," said Mr Grzebski. "I've got nothing to complain about."